Amazon has a great deal on eForCity Micro USB to HDMI MHL Adapter for only $4.28 with Free shipping during checkout. 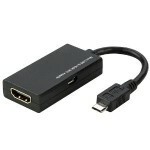 Use this micro USB to HDMI MHL adapter to connect your MHL devices to your HD Television. Connect your micro USB 5-pin port to an HDMI (type A) device. Supports all audio/ video resolutions, including 1080p. Power your cell phone while It’s in use with the charger. Supports up to 8 channels of audio and 7.1 surround sound. Works with 3D video and HDCP media protection. Designed for cell phone’s that use MHL technology. Uses Mobile High-Definition Link (MHL) version 1.0 technology.